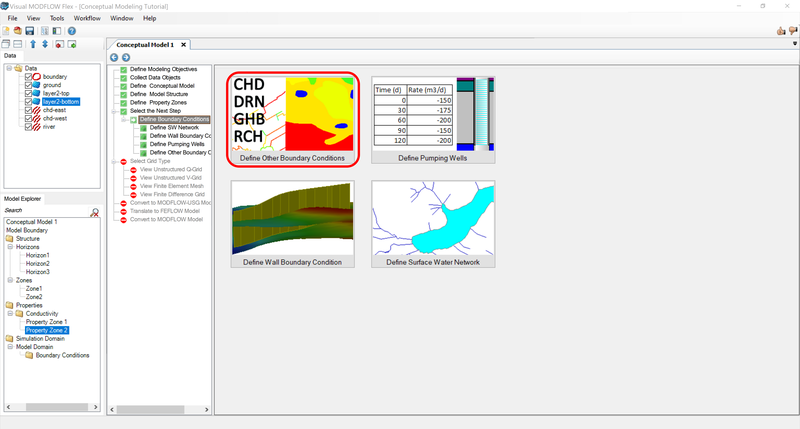 Visual MODFLOW Flex provides an improved approach and interface for working with pumping wells in the conceptual and numerical model. Visual MODFLOW Flex follows a logical approach of defining the well rate over the entire well, and independent of the numerical grid. With this "conceptual" approach, a single well can contain multiple screens, fully penetrating screens, or partially penetrating screen intervals over the depth of the wellbore. Pumping wells are defined at X,Y co-ordinates, and not assigned to specific grid cells. This provides flexibility in changing the numerical grid and the ability to readily use well locations (points) as grid node generators for MODFLOW-USG. In addition, if you are running a transport simulation, point source concentrations for an injection well are defined/edited on a per well level, an approach that more closely represents actual field conditions. 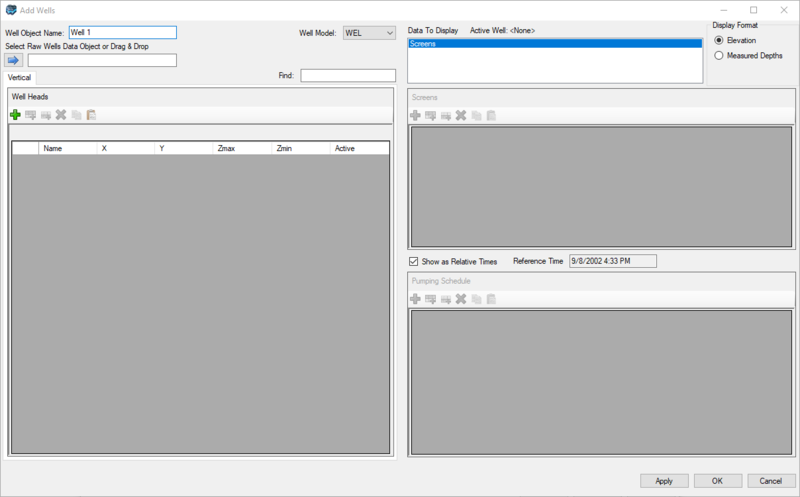 •Flexible labeling and rendering options in 2D and 3D. •Display the well name in the .WEL package, to correlate the conceptual well to a specific MODFLOW grid cell. •option to set individual wells as active or inactive for the simulation. The process of conversion is described below. The conversion process will involve deleting the wells in the numerical model and conceptual model and creating a new wells object utilizing the "raw wells" object (from the Data tree). If you have done cell-based editing of well rates in the numerical model, these edits will be lost. In addition, if you have assigned point source concentrations to wells in the numerical model (for a transport scenario), these changes will also be lost (you will need to re-assign these parameters after creating the new wells object). If you have made significant edits to well rates/schedules in the numerical model, then you may wish to avoid this conversion. ➢Make a list of the changes you made to the numerical wells object; you may wish to export out the well attributes to a CSV file (right-click on Wells in the numerical model and select Edit Attributes; save this file as a separate XLS or .CSV file), and use this as a means of checking your new wells later on. ➢Once you have finished, cross-check the wells in the conceptual and numerical model to verify your data are correct, and if necessary, adjust the rates/schedules. ➢If your previous wells object contained point source concentrations, then re-assign these values to the new wells object. •Right click on this object and select "Delete"
•Click Yes to proceed when the warning message appears. •Proceed to the next section to also delete the Conceptual Wells from the same project. 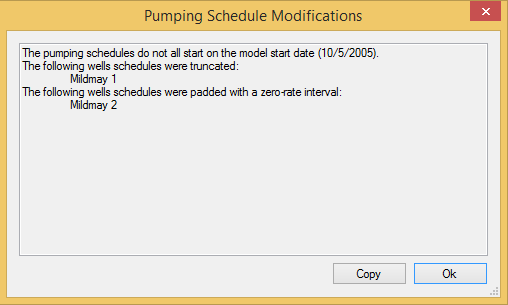 Please Note: deleting the conceptual pumping wells object will also remove the corresponding numerical wells from any numerical models that were derived from that conceptual model. •Select Assign / Using Data Object; as shown below. •Click once on the caption for this well to select it. •Drag the wells into the empty text box under "Select Raw Wells Object"
•Review the well data, then click OK to complete the process. Please Note: Creating a new wells object will also create a corresponding Conceptual Model Pumping Wells object; the data for these two wells are the same. •Once the new wells object is created, you can edit the attributes by selecting Edit/Well from the toolbox, and select any well in the numerical model. •Verify that the new wells object contains the correct values, and if necessary make the appropriate corrections. If your previous wells object contained species concentrations, then re-assign these now. Please Note: This step is only necessary if you have just a conceptual model with no numerical models. •Select Define Pumping Wells. A Create Well Boundary Condition window will appear; the layout is identical to what is shown in the section above for creating wells in the Numerical Model. •Click once on the caption for this wells object to select it. •Drag the wells into the empty text box under "Select Raw Wells Object". •Verify that the new wells object contains the correct values, and if necessary make the appropriate corrections. If your previous wells object contained species concentrations for a transport run, then re-assign these now. •Click OK to complete the process. 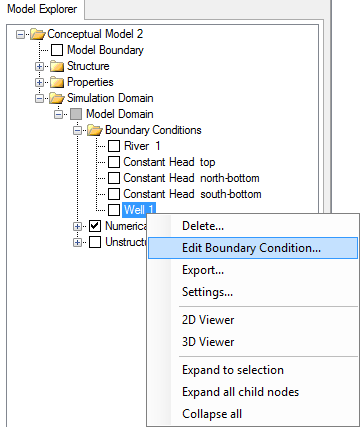 •Once the new wells object is created, you can edit the attributes by right-clicking on the Wells object from the Model explorer under Simulation Domain / Model Domain / Boundary Conditions and selecting Edit Boundary Condition from the menu as shown below. Allows you to point and click at locations in the grid (in the current layer) to define one or more well locations. This option is useful if you want to add just a few wells with a simple schedule, and do not have this data already in an Excel file. •Using the left mouse button, point and click at the desired location. •When you are finished, click on the "Finish" button on the Toolbox (this can be found under the "Assign" option), or right-click anywhere in the layer view of the grid and select "Define Attributes". •In the case where a wells object already exists, the following window will appear: (if there are no wells in the project, then the "Edit Wells" window will appear as explained below. •The "Edit Wells" window will appear; in this window you can define the screen geometry and pumping schedule. When you add a well with the click of a mouse, the default screen that is created will be fully over the layer thickness; the well Z max will be top of layer 1 and the well Z min will be the bottom of the bottommost layer. •Click OK to finish creating the wells. Allows you to create a pumping wells object by using an imported wells object as the data source. 2.All wells must start at the same start date, and this must be the model start date; in practice, this may not always occur, so VMOD Flex will automatically insert pumping rate of 0 for all wells that do not start at the model start date. •The Edit Wells window will appear as explained above. •Make the desired edits then click OK to apply the changes. Wells can be set as active/inactive for the simulation; use the "Active" column in the Wells grid to set the appropriate option; wells that are set as Inactive will not be translated to the .WEL package. When you have Transport set as active in the Modeling Objectives, you will have the option to define species concentrations to injection wells; this can be done in the Pumping Schedule, under the "Conc001" column. The injected concentration is assigned to the entire well interval. The default value of -1 is a flag indicating that the injected water does not contain the associated species. One column will be added to the pumping schedule for each species defined in the Modeling Objectives step - the column header will corresponds to the species name. 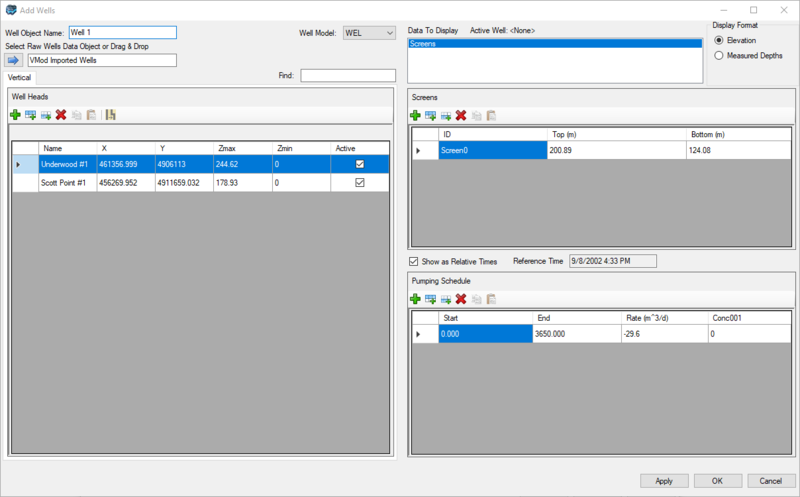 The pumping wells can be exported to a comma separated value (CSV) file; right click on the Model Explorer and select "Export"; a CSV file will be generated which can be loaded into a text editor or Excel.